Ukraine’s Cabinet has survived a vote of no confidence initiated by opposition MPs in the Verkhovna Rada. The decision was announced as thousands of opposition supporters rallied outside the parliament building. Only 186 MPs voted for the motion, well short of the simple majority of 226 needed for it to pass. Ahead of the vote, Ukraine’s Prime Minister Nikolay Azarov gave a speech in parliament, both appeasing the opposition members with promises of resuming talks with the EU and criticizing them over the current unrest on the streets of Kiev. Azarov’s major bargaining chip was apparently the EU’s alleged readiness to make concessions to Ukraine. “Yesterday, in my presence, the president of Ukraine had a long telephone conversation with the president of the European Commission, Jose Manuel Barroso,” Azarov said. The PM’s speech was peppered with chants of “Resign!” from some opposition MPs, who also demanded Azarov switch from speaking Russian to Ukrainian, which he would not do. Azarov apologized for law enforcement agencies’ actions during the dispersal of the pro-EU rally last week, and said that all those responsible for violence would face charges. At the same time, he called on the opposition to immediately end the blockade of the Cabinet of Ministers’ building. “You’ll be held responsible for this,” he told MPs. In addition to the cabinet building, protesters have blocked off the National Bank, the Trade Union building, and the Kiev mayor’s offices. 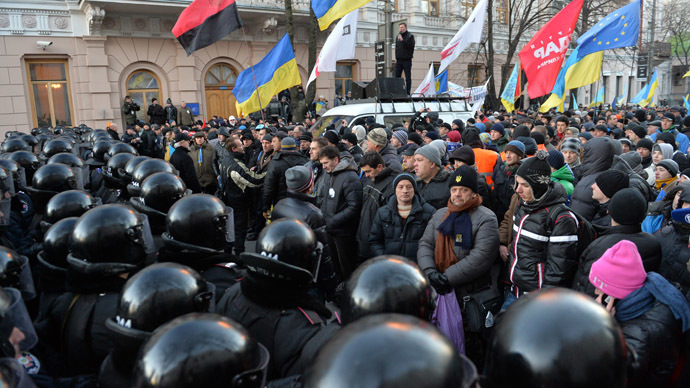 On Tuesday, the PM, cabinet and other government officials could not get to their workplaces, blocked off by the protesters, spokesman Vitaly Lukyanenko told RIA news agency. The motion of no confidence was called in the Rada on December 2 by opposition parties - Homeland (Batkivshchina), Strike (Udar), and Liberty (Svoboda). The text of the document accused the cabinet of “the betrayal of the Ukrainian people,” which was seen in the government’s suspension of talks on EU integration. According to Ukrainian laws, the cabinet, headed by Azarov, would have to resign if the motion was passed. At a parliament session, which took place earlier in the day, Ukrainian opposition leaders once again demanded that the government and President Viktor Yanukovich resign, and called for Interior Minister Vitaly Zakharchenko to face criminal charges over last week’s brutal crackdown on the opposition. 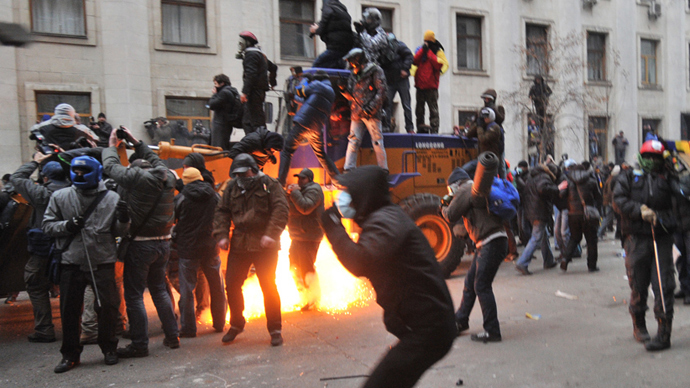 “The Azarov government is responsible for both the crackdown of the protest and the collapse of the economy. The country’s authorities must be fully and legitimately replaced,” said Vitaly Klitschko, leader of the opposition Strike (Udar) party. MPs from the ruling Party of Regions spoke against taking hasty decisions and called for a special commission to assess the situation in the country. 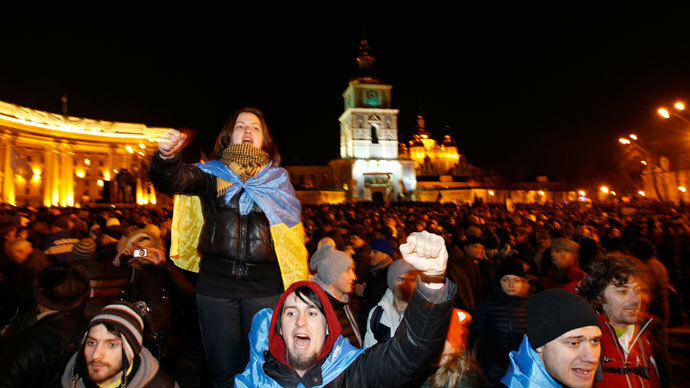 Since early morning, thousands of protesters have been rallying outside the Ukrainian parliament building to show support for the opposition leaders. Clashes erupted between the protesters and the Berkut special police forces, RT’s video agency Ruptly reported. 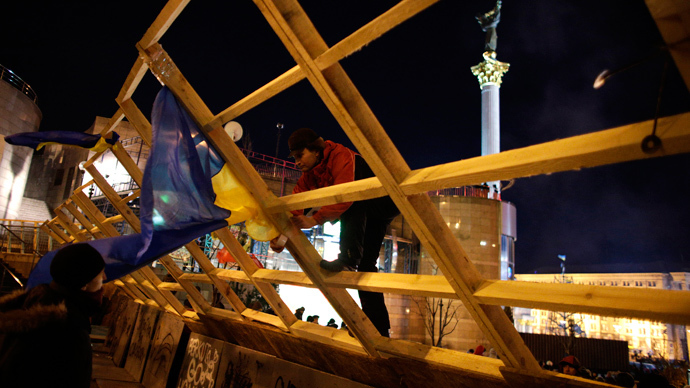 Dozens of rally participants tried to break through police cordons near the Rada. Some of them attacked police with sticks. The law enforcers have been fighting back, not letting the protesters pass. 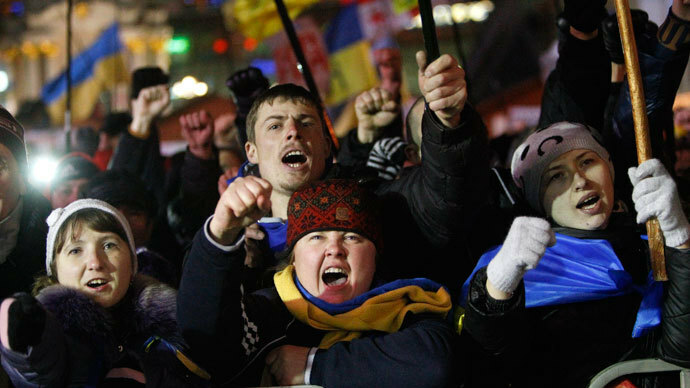 Supporters of President Yanukovich meanwhile have declared an indefinite rally in support of the leader. The pro-government demonstration has drawn around 200 people to Mariinsky Park, not far from the Rada. Having failed the no-confidence vote, the opposition has not given up on its protest. Batkivshchina (Fatherland) party leader Arseny Yatsenyuk has declared the rally participants will be blocking the Presidential Administration building to demand the government’s resignation and an early election. Yatsenyuk believed that president Yanukovich is still in Kiev, having not yet embarked on his official visit to China. Meanwhile on Independence Square (Maidan) the demonstrators have been erecting army tents and burning camp fires, possibly preparing to stay on the square overnight. At least 10 tents have been pitched near the stage, where performers have been entertaining the protesters, and more are being installed near the square. Reports quoted by Interfax also said that opposition leaders are meeting with several foreign ambassadors to Ukraine. The purpose of the meeting was not immediately clear.